Parimusmuusika, the sub-title of this joyous festival is translated from Estonian as 'folk music'. However, the wide range of artists on the bill shows how much genres blur. During four action-packed days in the bejewelled Baltic town of Viljandi, where as many as 25,000 visitors swell the population by some margin, there are dozens of groups who fit the standard profile of 'roots' ensembles. Accordions, fiddles, jew's harps and bagpipes are to be heard at regular intervals yet there are also irregular time signatures, challenging harmony and the daring improvisation that pertains to the jazz aesthetic. It is the Estonian artists who provide highlights in this respect, and the Tormis Quartet, featuring master guitarist Jaak Sooäär and vocalist Kadri Voorand, both familiar faces at the Jazzkaar festival in Tallinn, is simply majestic. Their interpretation of the works of Veljo Tormis, a renowned 20th century choral composer, generates enough warmth from a large audience to rival the heatwave currently sizzling through most of Europe. Compelling, unusually shaped melodies are given adequately expressive textures by Sooäär's wily battery of electronics, while second guitarist Paul Daniel brings understated, undulating rhythmic accompaniment to enhance the harmonizing of Voorand and fellow vocalist Liisi Koikson. If Nordic folk songs have been a staple source material for many ECM artists then Tormis is an equally fertile kind of stimulus for fresh modernity grown from a deep tradition, which is further bolstered by the arrival of the Ja Ellerhein Girls Choir. This makes for a spectacle that is as touching as it is sonically intriguing, and the collisions of old and new are also heard in performances by Mari Kalkun and Tintura, the former combining voice, kannel (zither), vibraphone and percussion, and the latter voice, violin, double-bass and drum programming to bewitching effect, reflecting a grasp of the dynamics of hip hop, as well as folk music and improvisation. 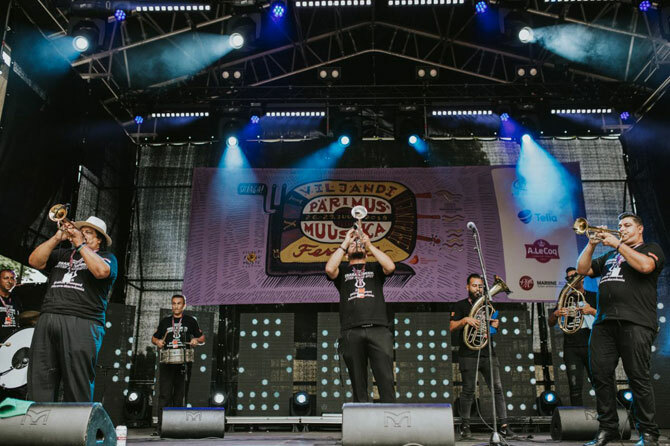 Established 26 years ago, Viljandi has a pedigree among festivals that can be ascribed to the beauty of the setting, as well as the quality of the line-up. The bulk of the concerts take place in the ruins of an old castle, whose drained moat has created a sensationally picturesque valley that sweeps down to a long and winding road. The biggest of the outdoor stages offers a breathtaking panorama of a shimmering lake. While these surroundings are remarkable, the town of Viljandi itself has immense charm, as cobbled streets, wooden houses, and small yards offer a soothing calm that is hard to find in a sprawling metropolis such as London. In this centenary of Estonian independence a burgh like this is a good advert for a quality of life that flows into the generally celebratory ambience of the festival, which is very family friendly. Yet the sharp melancholy of some of the music also resonates with Estonia's tragic past under Russian rule. Siberia is credited as the source of some of Tintura's songs, and it was in one of its prison camps that August Maraama, Viljandi's boldly progressive major, ended his days after being arrested and deported by Soviet authorities in 1941. Hence the sight of black, white and blue flags and civic pride that pervades most of the concerts makes a great deal of sense. Estonian Voices, the a cappella sextet led by the aforementioned Voorand, whose blend of jazz, folk and classical has attracted large audiences right across Europe captures that feeling as well as any other group. Arrangements that play artfully on the contrasting characters of the singers – the two sopranos Mirjam Dede and Maria Vali and tenor Mikk Dede all impress – are excellent and the harmonising is rich throughout. An orchestra, or rather orkestar, with a more raucous energy is Macedonia's Kadrievi, who elicit delirium and dancing in an audience that cannot resist the relentlessly swirling gypsy rhythms drawn from Eastern Europe and oriental sources. An octet with a mighty bottom-end provided by the bombardon (bass tuba), the group has the explosive character of a funky New Orleans marching band, and like its American counterpart, the standard of playing is high. As for Niger's Bombino, they play a storming desert blues not unlike Tinariwen, in which vocalist–guitarist Goumour Almoctar lays down rugged solos. Energy levels are kept up in the closing gala concert by Viljandi's artistic director Ando Kiviberg, who invites a few dozen groups on stage to play bite-sized sets to remind the audience of what they have had the chance to enjoy over the sun-soaked weekend. Georgian vocal group Debi Gogochurebi steals the show with its rapturous polyphony, but it is Kiviberg's nifty shape-shifting – he sings one minute, plays pipes and double-bass the next – that is a potent encapsulation of traditions in transition.